Read "Elexxxion" here. If you're coming from Rattle's site, consider joining my mailing list. My poem "Selfie" was published in issue 46 of Salamander. My poems "Emergency," "Stain" and "Smartphone" have been published in the Fall 2017 issue of COG. My first solo album is out now. Read more about it here. My poem "Robot" appears in the Fall 2017 issue of Blue Earth Review. You can read it here. My poems "Merger" and "Idle" appear in Issue 20 of No, Dear. You can read them here. New poems "Animals" and "Gender" are in the Fall 2017 issue of Matador Review. New poem "Trying" is in issue 10 of Calamus Journal. 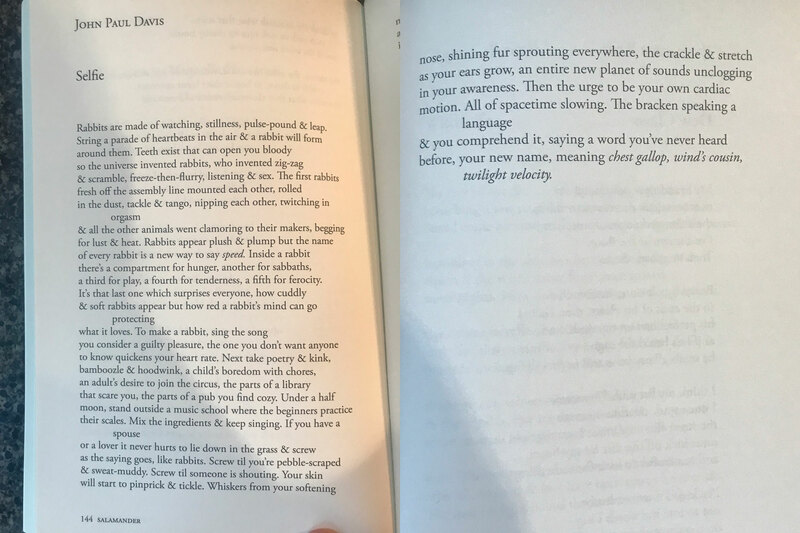 My poems "Self" and "Sound" appear in Apricity Press's latest issue. You're looking at the freshly-coded, just-launched, fifteenth version of johnpauldavis.org. 2017 marks 20 years since I launched the first version.